I think on average, it takes 10 days before I lose respect for the average person. 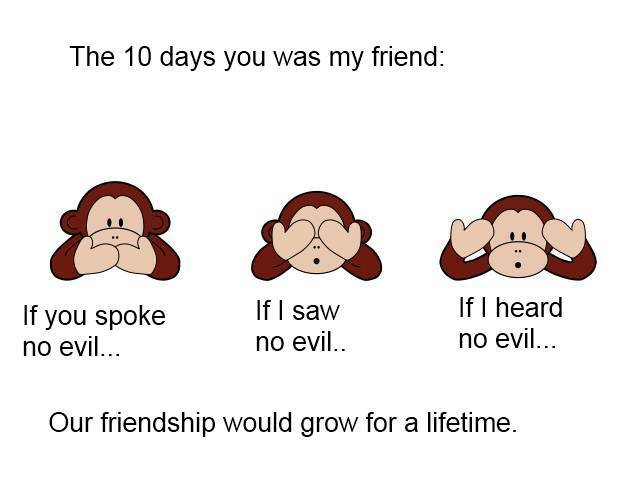 And I would assume my 10 day friends reciprocate and only grant me 10 days of friendship. 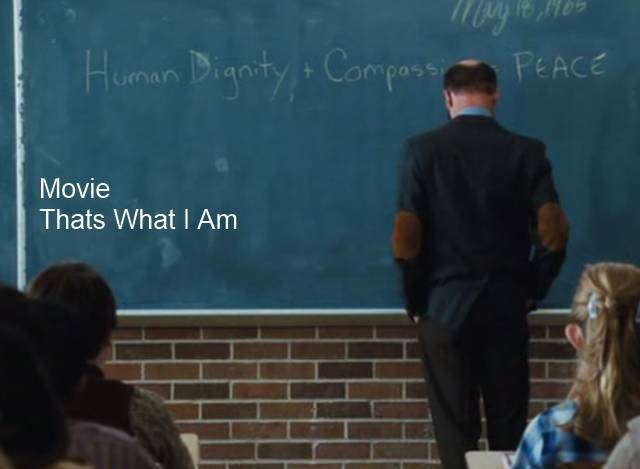 I watched a movie the other day, and the formula for world peace was written on the blackboard, I think it is the same formula needed for friendship. 2. Compassion is a virtue when one has the emotional capacities of empathy and sympathy. Peace is the result when two people care enough to treat each other with dignity and respect, and is the foundation of a good friendship. Generally, all people lie, and enjoy the company of liars, the average person champions the devil in their friends, and there is a strong bond between liars and cheats. However, the relationship is built on greed and selfishness, and is always a bargain. If for any reason a better offer comes along, the relationship ends in betrayal. I am a happy guy, I smile easily, often and laugh at myself, but find I can become very serious if anyone near me champions the clever liar. I am always sad to hear a person champion the clever liar, because my path has suddenly changed and I must adapt to the new road I am traveling. Friendship and love will grow continuously between two people, if they respect each other, and both always have the best intentions and motivations. Sad thought, but I guess if you are going to be a perpetual traveler then you can't be too attached. I am not going to say my friends are all perfect angels, but I enjoy them all the same. To say I am too perfect to associate with other less than perfect people would be rather snooty and hypocritical. I am extremely attached to my friends, you are just missing the point. We need to search for people that are capable of being long-term friends, or we just have series of 10 day friendships. Generally, the last thing a perpetual travel could every be considered is snooty and hypocritical.We or I open my world up to the whole world, while a person living in one place, only associates with an extremely small snapshot of people. You all believe you are open, then open your minds and come meet the world. It is a great life to live anywhere, and now with Skype.com, I can talk daily with people from all over the planet. I have 40-50 very dependable and trustworthy friends, who appreciate honesty, and avoid the too clever to be friend types. Tolerance has to be my middle name, but at the same time intolerance of people with no code of conduct that I cannot respect. Note, are you afraid to show your photo? Man!! It's a good thing I am not drinking any milk! This is really funny considering when I first started reading your blog you did almost anything you could to hide your face. Anyhow, just to make you happy I posted my picture. Oh, and I am glad you have some reliable friends, your post had me a bit worried.I am not sure I agree with what you said about those living in one place having to be so isolated. My family owns a travel agency and growing up I saw lots of people from many places and I never had to travel (although I did travel a bit, not as much as you, but a bit). It also could be argued that I saw them all in the context of my own environment, but I did see them. "The Internet is a cesspool of misinformation." Reporters are killed all the time, I think in the Philippines 125 plus reporters were killed last year. Yesterday, I took down a video of a man who must be wanted by the law in the USA, because he got so belligerent and I see him daily here in Sosua. If you are going to infer, or allude, or say that I "rather snooty and hypocritical" then you need to be you, no hiding behind anonymous. We are going to soon rate readers, from NOT to be Trust, to Highly Trusted. We will give stars next to names, and the 10 star people will have their comments posted without question, because they are a real person. I had to show my face, I did not want to, because I am now in danger of being killed. Are you in danger or being killed because your photo is here? I truly am in danger of being killed, I was threatened by the police in Bangkok after the Tsunami for saying to not donate to their box. Tyler or Brent or whatever the stupid idiots name is, threaten to come down to DR to find me yesterday, too stupid for words. The world changes that is guaranteed, if a better idea comes along, I will look hypocritical and change my stance, I am not petty. Thank for man up and being you.